Saturday march 14th 1925 I went over to the Senate Chamber by 10:30 and stayed till 3.30 listening to speeches in regard to The Cousins tax bill and the confirming of Charles B Warren for Atty General. I got lunch before I came home. I read Iowa City papers and a book. Had letter from Warner McCall. Wrote to Ott. Mrs. O'Leary in my room. 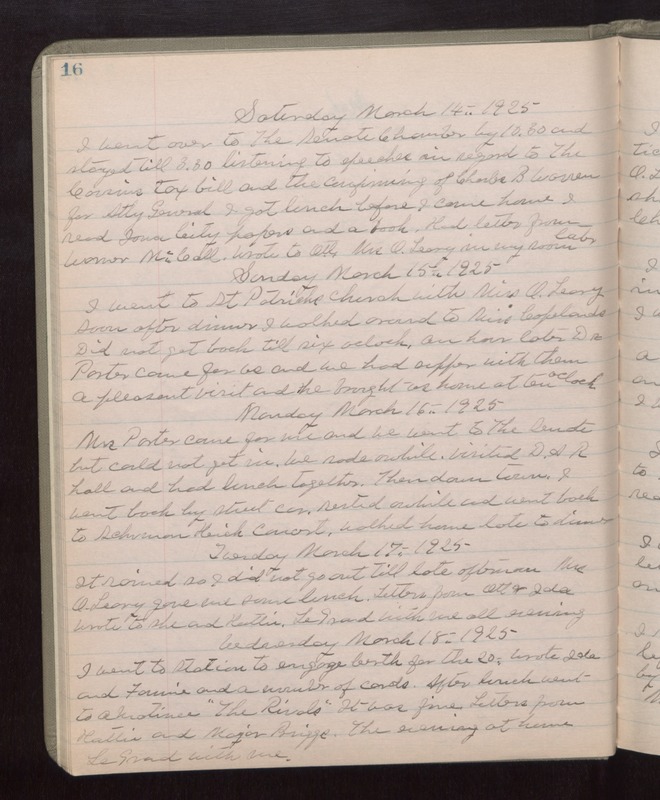 Sunday March 15th 1925 I went to St. Patricks Church with Miss O'Leary. Soon after dinner I walked around to Miss Copelands. Did not get back till six oclock. An hour later Dr. Porter came for us and we had supper with them. A pleasant visit and he brought us home at ten oclock. Monday March 16th 1925 Mrs Porter came for me and we went to The Senate but could not get in. We rode a while. Visited DAR hall and had lunch together. Then down town. I went back by street car. Rested awhile and went back to Schuman Heich concert. Walked home late to dinner. Tuesday March 17th 1925 It rained so I did not go out till late afternoon. Mrs O'Leary gave me some lunch. Letters from Ott & Ida. Wrote to she and Hattie. LeGrand with me all evening. Wednesday March 18th 1925 I went to station to engage berth for the 20th. Wrote Ida and Fannie and a number of cards. After lunch went to a matinee "The Rivals." It was fine. Letters from Hattie and Major Briggs. The evening at home. LeGrand with me.